Bluebird Gardens tips for fall gardening in Missouri. Fake or Real Christmas Tree? 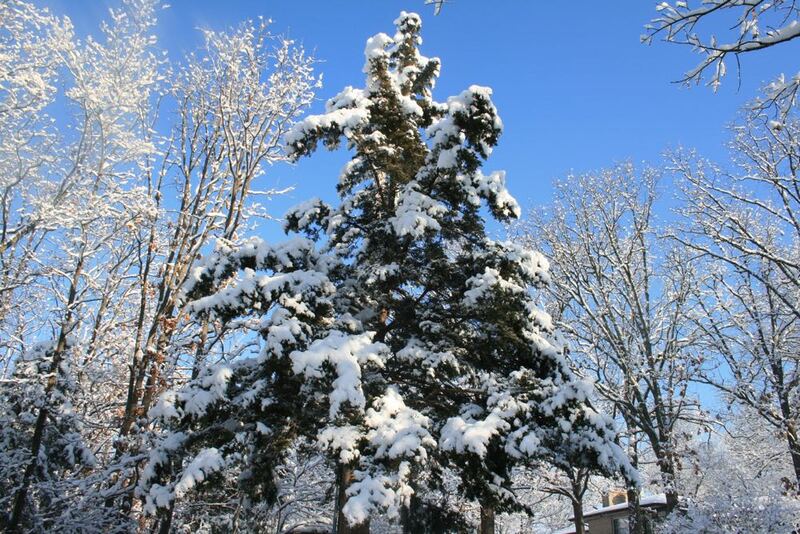 My favorite kind of Christmas tree, outside, living and covered in a blanket of snow! When I married someone who wanted to go out into the woods to cut down a tree to decorate, I frankly balked. As a gardener who regularly planted trees, the thought of cutting one down for a mere few weeks didn’t make sense so we compromised. One tree could be cut down as long as we planted one to even the score. Since then, there’s been an interesting shift in terms of what is considered to be environmentally friendly. Today using cut trees is considered eco-friendly because they are a renewable and biodegradable natural resource. On average, it takes about seven years to raise a Christmas tree to marketable size. During that time, it is absorbing carbon dioxide and filtering the air and releasing oxygen. It is also providing watershed protection and habitat for birds and other wildlife. Christmas trees are also planted and raised as a crop by tree farmers. Unlike other row crops, a Christmas tree plantation remains green and growing year-round. If there was no market for real Christmas trees, that land would probably be developed for something else so there’s something to be said for keeping another piece of land in a green strip. 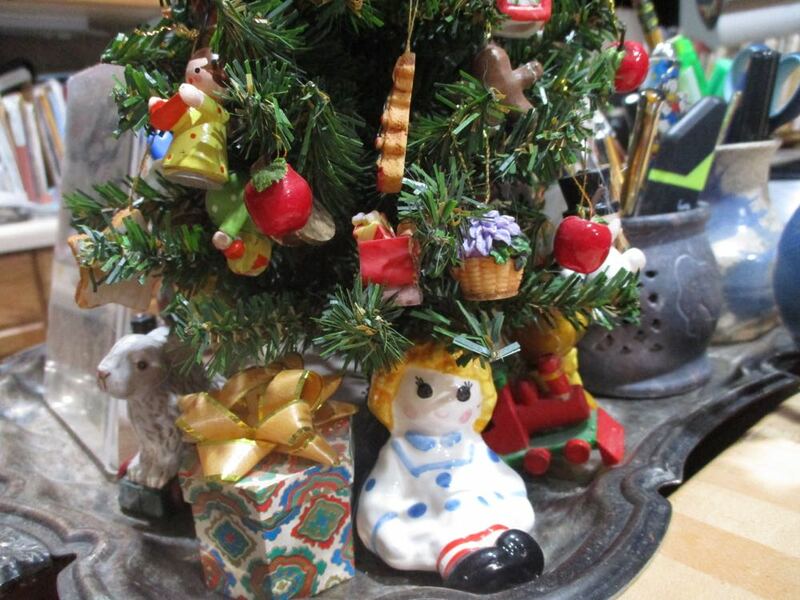 The artificial Christmas tree that stays out all year around, this time of year in my kitchen, surrounded by vintage salt shakers in the shape of dolls, teddy bears and trains. In contrast, artificial Christmas trees are made primarily of metals and plastics, which are all non-renewable resources. The plastic material, typically polyvinyl chloride (PVC), is a potential lead source. The potential for lead poisoning is considered high enough that California requires a warning label on all artificial trees made in China, and an estimated 85 percent of artificial trees are made in China. Additionally, these trees must be transported 8,000-plus miles to their U.S. destination, which emits additional CO2. On average, an artificial tree is used for seven years before it ends up in the landfill. Regardless of how many years it is used, it is still going to end up in a landfill far longer. In contrast, a real Christmas tree can be composted, submerged in ponds for fish habitat or made into wood chips. I still contend a tree should be planted for every one cut down, even ones cut from tree farms. Although these artificial tree use are national averages, they are not typical for my family or friends. Ou artificial Christmas trees have been used for closer to 25 years including surviving breaking in kittens and frisky cats. Now there are a couple more good uses for artificial Christmas trees. My 18-year old cat Margaret used to like to climb the family Christmas tree so she would get one all her own, without lights or ornaments, tied to a post. Somehow she knew it was hers and would spend hours underneath it napping or waiting for someone to walk by she could ambush with a paw, or jump on moving feet. Now that she’s older she still likes to nap under the Christmas tree so artificial trees make nice cat toys. She’s no longer interested in climbing so the extra tree top is becoming a door wreath. Margaret has also turned the tiny artificial Christmas tree I have in my kitchen into her equivalent of a dinner bell. When I'm not paying the attention she thinks she deserves, Margaret will climb on the stool next to my kitchen island and nudge the little Christmas tree sitting on the silver platter until it falls over. Do I think she does it deliberately? Now what do you think? Artificial trees can also be made into swags, wreaths andgarlands, and you can hang one upside down and join the latest Christmas décor trend. Or let your cat do it for you. Contact Charlotte at gardeningcharlotte at gmail dot com.